HEROES: Canadians Jim Thomasson and Jim Tarnowski, and CFA's Wayne Rigg and Simon Scharf during a recent firefighting course. After three decades firefighting and 15 years battling bushfires from the air, Bell Post Hill’s Simon Scharf will embark on a career-first this month. The 51-year-old on Tuesday joined a CFA contingent flying to Canada to help water bomb blazes in British Columbia. “I started fighting fires as a volunteer when I was 17,” he told the Indy before flying out. 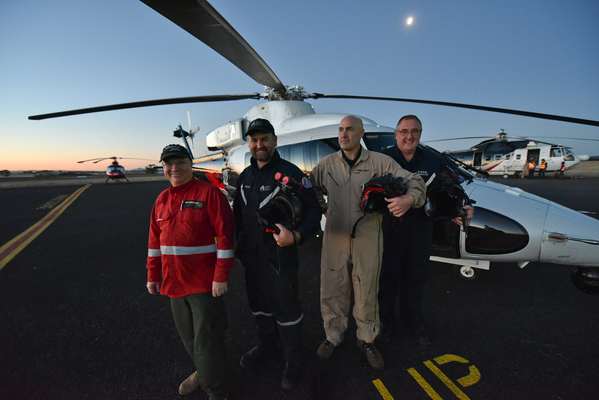 The Lara station officer and father-of-three recently completed CFA’s first-ever night aerial firefighting course. “This will be a game-changer – to be able to fight fires after dark, which we’ve never done,” he said. Australian firefighters were second in the world to develop the capability, behind authorities in California, Simon said. Australian aviation law restricts how low aircraft can fly at night and water bombing fires above that altitude is ineffective. But training with cutting-edge GEN III night vision binoculars would allow CFA helicopters and planes to go below the altitude, Simon explained. Simon became an air observer in 1993, mapping operations from the air as the “link” between ground and air crews. “We do that so we can identify those ground crews and make sure they’re safe,” he said. Simon discovered the role thanks to his interest in cartography and aviation, and workmates at the time, he said. Simon works in a confined space in often “horrid and bumpy” conditions, the worst of which occurred above Weerite, near Camperdown, on Black Saturday in 2009. He struggled to write notes in his logbook as they tracked a deadly grassfire. He remembered tracking the 300 hectare fire as it burnt paddocks at 15 km/h. “It was the fastest-running grassfire I had seen,” he said. He saw a 40-seat bus on the Princess Highway heading straight for the fire, before it turned around. “Which was a really good decision on his part,” he said. Despite conditions that would terrify a nervous flyer, Simon was too busy to be afraid. “It’s a very mentally draining job,” he said. “It’s the sort of thing where you’re trained well in smaller fires where you can build your experience. Following Black Saturday Simon became an air attack supervisor, directing aircraft where to water bomb without hitting ground crews. “It’s integral to the safe operation of the aerial attack,” he said. Simon has met several Canadian firefighters who came over during the Australian summer. “Hopefully I come across those guys over there again,” he said.